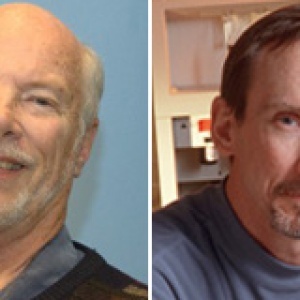 David Deamer (left) and Mark Akeson (right) established the UCSC nanopore research group in 1996. 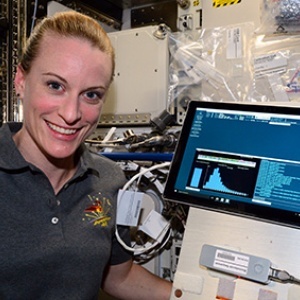 For the first time ever, DNA was successfully sequenced in microgravity as part of an experiment performed by NASA astronaut Kate Rubins aboard the International Space Station. The device she used is based on nanopore sequencing technology developed by researchers at UC Santa Cruz in the Baskin School of Engineering. "The fundamental research and patents underlying the technology of nanopore sequencing were carried out here at UCSC," said David Deamer, research professor of biomolecular engineering at UC Santa Cruz. UCSC's nanopore technology was licensed by Oxford Nanopore Technologies of Oxford, U.K., which subsequently developed the MinION sequencing device used on the International Space Station. 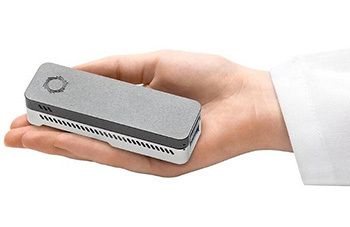 The device, which analyzes DNA molecules as they pass through a tiny pore (a "nanopore"), is compact and portable. It fits in the palm of a hand and plugs into the USB port of a laptop or tablet. "This is a wondrous technical achievement by Oxford Nanopore and NASA. I am proud of UCSC's key role in helping build the foundation that made it possible," said Mark Akeson, professor of biomolecular engineering at UC Santa Cruz. Deamer first came up with the idea for nanopore sequencing in 1989 when he was at UC Davis. At UC Santa Cruz, he and Akeson established the nanopore research group in 1996, making important advances in nanopore sequencing technology in the subsequent decades. They both serve on Oxford Nanopore's technology advisory board. "Nanopore sequencing is an ideal example of how academic scientists can collaborate with businesses to develop new instruments with unprecedented capabilities," Deamer said. "Clive Brown, who led the development of the MinION at Oxford, suggested that it will make possible an internet of living things. That sounds right to me." According to NASA, the ability to sequence DNA in space could enable astronauts to diagnose an illness, or identify microbes growing in the International Space Station and determine whether or not they represent a health threat. A space-based DNA sequencer would be an important tool to help protect astronaut health during long-duration missions on the journey to Mars, and future explorers could also potentially use the technology to identify DNA-based life forms beyond Earth. NASA's Biomolecule Sequencer investigation sent samples of mouse, virus, and bacteria DNA to the space station to test the MinION DNA sequencing device. Rubins, who has a background in molecular biology, conducted the test aboard the station while researchers simultaneously sequenced identical samples on the ground. The tests were set up to attempt to make spaceflight conditions, primarily microgravity, the only variables that could account for differences in results. For example, the samples were prepared on the ground for sequencing, and researchers selected organisms whose DNA has already been completely sequenced so that they knew what results to expect. As the researchers compare results from the sequences collected in microgravity and on Earth, so far everything seems to match up, according to a NASA press release. “A next step is to test the entire process in space, including sample preparation as well as performing the sequencing,” said project manager and NASA microbiologist Sarah Castro-Wallace. Then astronauts can move beyond creating a known DNA sequence and actually extract, prepare and sequence DNA to identify unknown microbes on orbit. In addition, the sequencer can become a tool for other science investigations aboard the station. For example, researchers could use it to examine changes in genetic material or gene expression in orbit rather than waiting for the samples to return to Earth for testing.